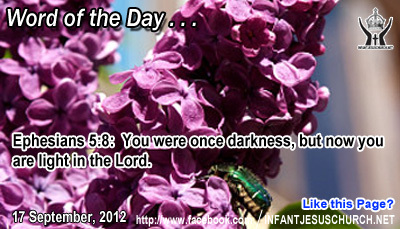 Ephesians 5:8: You were once darkness, but now you are light in the Lord. Heavenly Father, by your grace we know today that we stand before you welcomed into your presence and received as a beloved child. Thank you for saving us from all the traps of the darkness and bringing us into your light. Direct our heart and our feet so they will walk your path and show forth your light. Through Infant Jesus we pray. Amen. The centurion who came to Jesus was not only brave, but faith-filled as well. He risked the laughter of his Roman companions by seeking help from a Jewish preacher from Galilee, as well as ridicule from the Jews who despised Roman profession of their land. However, this centurion approached Jesus with self-confidence and humility. St.Augustine notes that the centurion look upon himself as worthless to receive the Lord into his house: "Humility was the door through which the Lord enters to take full ownership of one whom he already possessed." The centurion was an unusual man because he loved his slave. In the Roman world slaves were treated like animals rather than people. The centurion was also a strange man of faith. He believed that Jesus had the power to heal his beloved slave. Jesus commends him for his faith and straight away grants him his request. Are we willing to undergo ridicule in the practice of our faith? And when we need help, do we approach the Lord Jesus with hopeful faith?